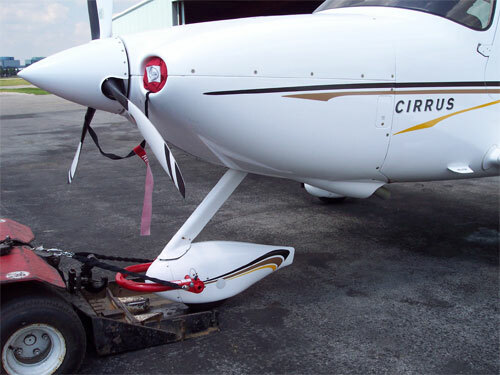 This adapter allows any Lektro owner to move Cirrus SR2X and Grumman Tiger/Cheetah etc. The new method of moving Cirrus' is quicker and easier than using a motorized towbar, less time consuming/dangerous than using a conventional tug/towbar and safer than the Lektro holdback arm/strut strap. Also, the adapter’s small size eliminates the occurrence of wheel pant scratches caused by cumbersome conventional towbars. The Redfab SR/AA adapter is not only Lektro approved but also noted in the Cirrus Training Guide as an essential interface tool between Cirrus and Lektro tugs. Download the pdf for more info. Download this PDF for more info. How many?